I thought I had probably seen my last butterfly of 2016 when I started to put together this collection for 2016 – only to see a peacock flitting around on my lunchtime walk yesterday. Sunny weather or disturbance can bring out some of our hibernating species during the winter so the ‘season’ never truly ends! This green-veined white butterfly was feeding on the greater stitchwort flowers in the Nottinghamshire Wildlife Trust reserve Treswell Woods earlier this year. 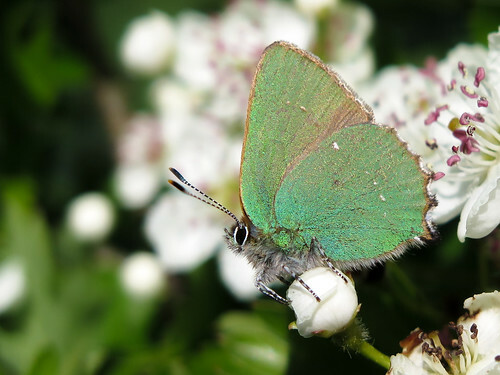 A closer view reveals the yellow pollen from the anthers on the legs of this butterfly which will likely be transferred to the next stitchwort flower on which the butterfly alights. 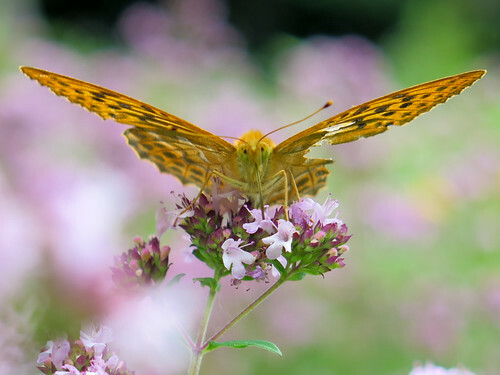 This act of pollination is the reward which the flowers get in return for their nectar they provide. 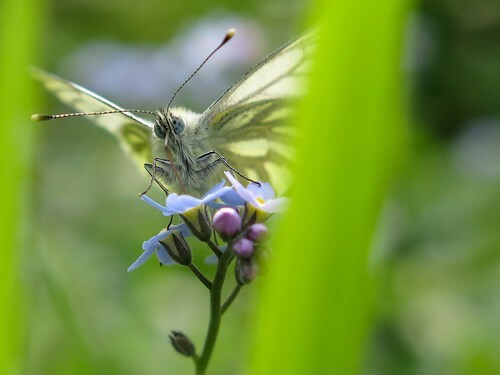 This is a close-up photo of a orange-tip butterfly – I love the chequer-board green eyes. 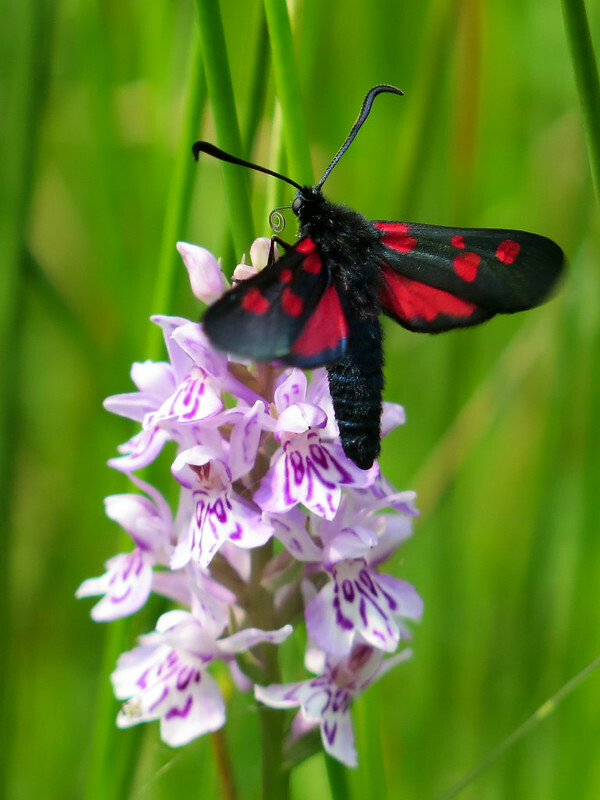 This individual was resting with folded wings on a white flower and their camouflage really is superb in this pose – until their open their wings and reveal those gaudy orange wing-tips from which they derive their name. This year was a good one for dingy skippers – I was lucky enough to see them at a number of different sites.This was at a Warwickshire Wildlife Site – Harbury Spoilbank – where grizzled skippers and green hairstreaks are also to be found. This is a male and a female pre-mating in the low vegetation. Another skipper from another Warwickshire Wildlife Site – this time at Ufton Fields. This is the grizzled skipper, a tiny little butterfly which could easily be mistaken for a moth at first glance as it zips past. This one is feeding on a speedwell flower. This is one of the UK’s rarest species – the wood white taken at Ryton Woods in Warwickshire. I took a walk around the rides hoping to spot this species and was just about to give up hope when this one appeared, bouncing along the edge of the rides. Their flight is slow and delicate and the males spend much of their time patrolling in search of females on the vegetation. I followed this one a while and got just one or two photos before he fluttered on over some dense scrub away from the path and out of sight. This is a common blue butterfly perched on one of their favourite food plants – the bird’s foot trefoil. I like this photo as you can see the curled tongue protruding. This long tongue straightens when they feed, allowing them to reach nectar from deep within the flowers and to access resources that many insects cannot. 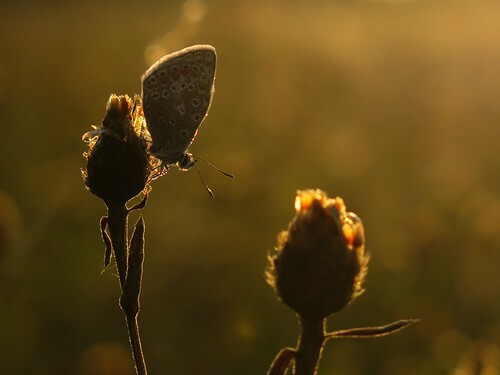 This photograph of a common blue was taken at sunset at Muston Meadows NNR in Leicestershire. 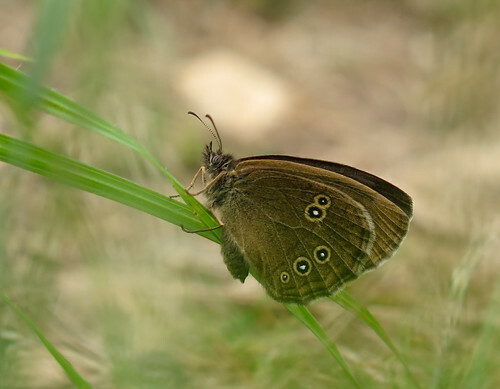 The butterflies settle on vegetation such as this, always seemingly adopting this downwards-facing pose, at the end of the day. This one tried several locations before finding a position it was happy with. The butterflies spend the night roosting like this, ready to awaken when the temperatures rise again in the morning. 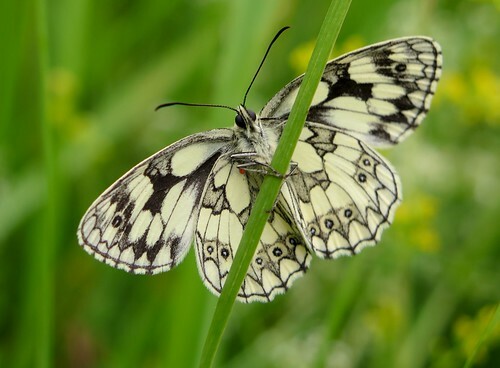 This orange tip was displaying the colouration which gives the species its name, although it is only in fact the male butterflies which have orange tips – the female butterflies have black tips. Orange tip butterflies favour flowers of the cabbage family and this individual alighted and then departed several non-cabbage flowers before settling and drinking deep from these dame’s violets growing along The Drift SSSI. I think it’s only fair to include a raggedy painted lady butterfly in this collection, considering the journey these butterflies make to get here. 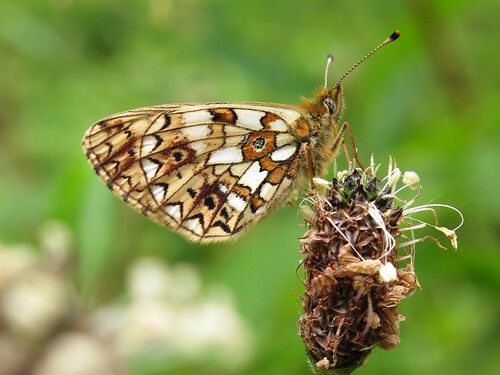 This was taken feeding on hogweed along the Grantham Canal – many miles inland from the sea across which this butterfly had flown to get here. This species does not breed in the UK which means that every individual you see will have migrated from the continent. I rather liked the angularity of this photograph of a marbled white in a slightly unusual pose. 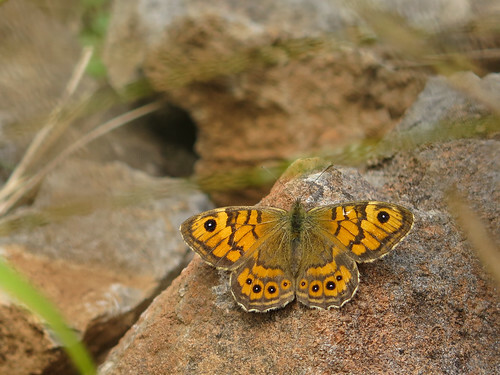 I do not know of a site local to me where these butterflies are found, but they occur in good numbers in many grassland sites in Warwickshire where I have spent some time this summer. 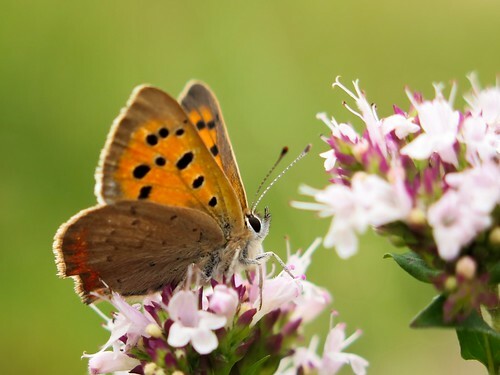 These butterflies seem to favour thistles – newly emerged individuals will alight temporarily on all sorts of purple flowers – from ragged robin to orchids – until they get their eye in for the thistle flowers they are seeking. 2016 wasn’t a good year for the small tortoiseshell with low numbers recorded through much of the summer. I saw a few more in the later months, such as this one feeding with several others on a patch of thistles in a pasture field. Nettle and thistle often come to dominate patches of higher nutrient ground within pasture fields. The imago – adult butterflies – love the thistle flowers, and their caterpillars feed on nettle, so this combination of species is ideal habitat for small tortoiseshells. 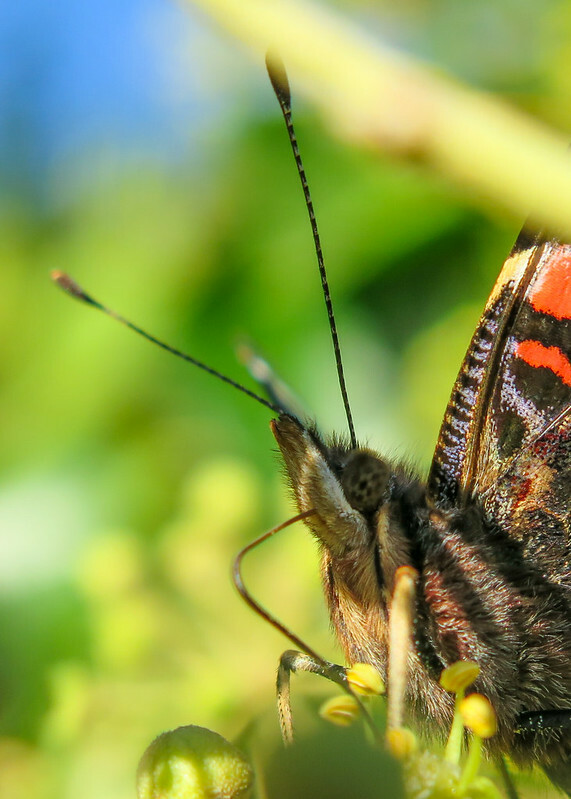 A red admiral to finish – these are one of our few species which hibernate along with small tortoiseshell, comma, peacock, speckled wood, clouded yellow and brimstone butterflies. This individual had found the patch of naturalised Michaelmas daisy in the grassland above Grantham in October, along with a range of bees and hoverflies – and was taking advantage of the nectar source and autumnal sunshine before finding somewhere dark and stable to fold its wings and await the spring.